A few years ago Jodi asked me, like she has asked so many people on this website, what book I wanted to read before I died. I eschewed the Russians, the bible, all sorts of weighty tomes for this: Underworld by Don Delillo. Underworld was published when I was in college, a part time bookseller who touched so many books in the course of a day, shelving new fiction, shelving classics, shelving How-To manuals and graphic novels and dictionaries. 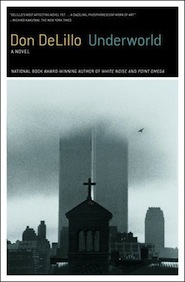 Underworld was something else, much buzzed about, a grey image of the World Trade Center buildings bisected with a church steeple. I directed many-a customer to its spot in the store and set it into hands. That’s one of the rules of bookselling: Make the customer hold the book. By the time it came out in Trade Paper, I was a frothy mess of curiosity. I had to read it. I dug in. The prologue is about 60 pages of the Giants v. the Dodgers, Branca v. Thompson. The shot heard around the world. A young kid skips school to jump a turnstile and watch the game. It is expertly drawn from different perspectives: This kid, Cotter, who loves baseball. The response of the crowd, littering the outfield with strips of paper, receipts, pieces of magazines, debris. J. Edgar Hoover as part of a foursome that includes Jackie Gleason, Frank Sinatra, and Toots Shor. The buildup to the key moment in New York City baseball history and the way Cotter eventually oozes through the crowd for the game-winning baseball, giving a man a snake bite to relinquish his grip, Jackie Gleason barfing up hot dogs and drinks and the splatters landing in the cuffs of Sinatra’s pants. This scene is famous, well, as famous as a scene from a book can be. It has been republished in Best Sports Writing of the Century, among a handful of other places where I have stumbled upon it. It’s great. It is detailed. It is exciting and funny and super visual. But it is the reason I’ve spent the past decade and a half failing to read this book. Step One: Begin reading Underworld, including it’s massive prologue. Step Two: Continue reading into the introduction of garbage administrator Nick Shay, his suspicions about his wife’s infidelity, his handful of big-drinking work friends, a reconnection with the artist Klara Sax he banged when he was a teenager. Step Three: Feel the weight of this book, all 800 plus pages and these vignettes that are getting introductory treatment. Feel mind wander. Step Four: Set down Underworld just a few too many days in a row. Until the book opens automatically to the place where it has been left sprawled face down. Step Five: Retain curiosity about the book, read others by Don Delillo. Step Six: Resolve to read Underworld, but come to resent the prologue, THE PROLOGUE, so long, so baseball, read so many times you could one-act play it at an after bar probably. But know that you cannot read Underworld without revisiting that prologue. It’s part of the book and it’s necessary. Step Seven: Think about how much you want to read Underworld, but just don’t. Step Seven: Repeat upward of seven, eight times. At exactly 1 p.m. Central Time on January 14, 2012, I finished Underworld. It took two weeks. It took re-reading the prologue (again) but reading it in a new way. It was interesting again. Mind blowing in its attention to detail. Delillo painting mini figurines that require a magnifying glass to shade the laugh lines with his Lilliputian brush. It spans about four decades in America, starting with the famous baseball game, then jumping between periods. At its center is Nick Shay, who now believes he owns the game-winning ball, though who can know for sure. He keeps it as a memento of failure, since his team lost that day and forever erased his interest in baseball. Shay has a muddied past. He grew up in an Italian neighborhood in NYC and his life took a seedy lean where people steal and connive and cruise around in a stolen car. There are hints that despite his relatively normal life as a middle aged man, he once killed a man. He also once got hot and heavy with the wife of his brother’s chess coach. These bits of bio are dropped, little nuggets, and the stories are brought back into play in a measured way as the story progresses. There are whole chunks on Shay’s brother, a former chess whiz, who struggles socially. The artist Klara Sax, who spends a summer struggling to find a reason to paint, a mysterious young girl who forages through garbage cans and lives on the street, an expert graffiti artist who stains the subways with his wildstyle creations. J Edgar Hoover attends Truman Capote’s party, but first spends time with his assistant and chaste romantic interest, a nun, Cotter’s wheelin’ and dealin’ for a dime father. This book is insanely imagined. Who the heck is Don Delillo and can I get a copy of his brain scan? How did he do this? He weaves fact and fiction, binds it so tightly, that the seams aren’t even visible. Consider a section in which Klara Sax goes to see lost film footage by the Russian filmmaker Sergei Eisenstein. Delillo actually describes this footage in pretty great detail, staying true to the filmmaker and what kind of lost footage he might have collected at this period in his life. In the same book, Delillo successfully gets into the head of a graffiti artist, the best around, walking the walk, talking the talk and embracing the lingo and the fears and the moment of pride when a train he has painted emerges from a tunnel. I’ve said before that this or that book is about “everything” and now I fear that I’ve wasted that descriptor on things that weren’t about “everything” compared to the way Underworld is about everything. So, fresh slate. Underworld is now the official about everything book. And, nearly 15 years after I first tried to read it, I’m going to make my grand claim that this is the best book I’ve ever read. I’m also going to use the battle cry of virgins everywhere and say I’m glad I waited. The me of 1997 wouldn’t have gotten as much out of it as the me of 2012. I knew nothing about street art back then and was certainly short on J. Edgar Hoover facts.